5 Bedroom Detached House For Sale in for Asking Price £1,895,000. 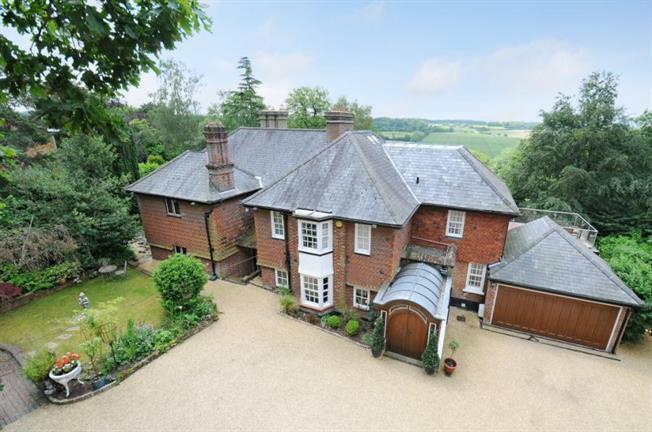 This is a rare opportunity to purchase a beautifully presented period house situated in the heart of Keston Village, on a good sized plot with outstanding rural views to rear. The accommodation has all the charm of a character property that has been beautifully preserved and enhanced throughout. Benefitting from five good sized bedrooms with three contemporary/modern bathroom suites. The ground floor features an entrance hall with vestibule and high ceilings providing access to a magnificent panelled living room with two unique inset and inglenook fireplaces. There is additional living space with a family room and a beautifully presented Mark Wilkinson kitchen, fully fitted with full width bi-fold doors taking advantage of the tremendous sunny and rural view aspect to rear. Other features include, double glazing, solar hot water, attached double garage, beautifully tended gardens both to front and rear, all positioned in this highly sought after location. Reception Hall High ceiling, cast iron radiator, sash bay window to front, cornice, oak staircase, oak panelled feature, dual aspect sash windows to side. Kitchen/Breakfast Room Bright and open space with bi-fold doors opening 9 metres, providing access and views over gardens to rear and rural distant views, the kitchen is bespoke fitted by Mark Wilkinson with hand painted wall and base furniture, underfloor heating, ceramic work surface areas, a Falcon gas range, appliances include a Miele coffee maker, integrated American style fridge/freezer, central island/breakfasting bar with granite top, butler sink with double bowl, mixer tap and rinser, waste disposal, oak canopy with extractor fan, two dishwasher drawers, ceiling speakers, high ceiling, low voltage lighting, breakfasting area, walk-in pantry, separate door to lounge, travertine tiled floor, doors providing access to utility room. Outside A plot of approximately a third of an acre, situated in the highly popular Keston Village, the gardens are mainly laid to lawn with large paved terrace and patio areas providing far reaching rural views, westerly facing, garden shed, undulating aluminium framed greenhouse to side, well stocked with flower, shrub and herbaceous borders, ornamental fish pond with fountain, terrace surround, well stocked rockery to side, large gravel driveway with extensive off-street parking. Yoga Barn Over 90 years old, originally built for storing apples. The apex of the vaulted ceiling is approximately 7 metres high. Lovingly refurbished to provide a commercially operating yoga studio, with six specialist teachers. The roof is made from Canadian cedar wood tiles, solid wood flooring, attached door to side with access to cloakroom with low level WC, wash hand basin.